Guru Nanak Dev Ji was the first guru and founder and of Sikh Religion. Know more on history, profile and biography of Guru Nanak Dev ji. Guru Nanak Dev Ji - Born on 15th April, 1469 at Talwandi in Pakistan of today, Guru Nanak Dev Ji, the first Guru of the Sikhs is believed to be the founder of the religion who was sent to earth by the almighty as a harbinger of peace and brotherhood by dispelling away the anguish and woe. Better known as Nanakana Sahib, his birth place is now in the Shekhpura district of Pakistan. Falling on the full moon day of Kartik by the Hindu calendar, his birthday is annually celebrated with a great pomp and show by the Sikhs. Born at the house of Mehta Kalyan Das or Mehta Kalu, Chief Accountant of Rai Bular and Mata Tripta, an undemanding, virtuous and extremely devout woman, Nanak was the beloved brother of Nanaki, his elder sister. A rare personality since childhood, Nanak was the master of an astute rationality and pensive mind. He was sent to language schools to learn Hindi and Sanskrit at the age of seven where he surprised all his teachers with his divine knowledge. He also learnt Persian and became the most learned guy in the region at the mere age of 16 years. Despite many efforts of his family, Nanak could not concentrate on the worldly pleasures and always reacted in a saintly manner. He was rebuked a number of times by his father for doing so, but in vain. In August 1507, he realized that the almighty was calling him to dedicate his self to the service of humanity after taking a holy dip 'Vain Nadi'. There was thence no looking back and here on he started undertaking long travels to preach his unique and divine doctrine (Sikhism). These travels were not limited to Punjab only rather they were long tours that covered various religious shrines in India and abroad. These tours are popularly known as Char Udasis of Guru Nanak Sahib. Kurukshetra, Haridwar, Joshi Math, Ratha Sahib, Nanak Matta, Ayodhya, Prayag, Varanasi, Gaya, Patna, Guwahati, Puri, Cuttack, zameshwaram, Ceylon, Bidar, Baroach, Somnath, Dwarka, Janagarh, Ujjain, Ajmer, Mathura, Pakpattan, Talwandi, Lahore, Sultanpur, Bilaspur, Rawalsar, Jawalaji, Spiti Vally, Tibet, Ladakh, Kargil, Amarnath, Srinagar and Baramula were all covered by Nanak during these tours. He even went to several Muslim shrines like Mecca, Medina, Beghdad via Multan and Peshawar. His tour aimed at general awakening of the masses in order to bring about a realization of God. Nanak even appointed certain able and dedicated followers as preachers of Sikhism. This was observed as sowing the seeds of Sikhism all over India and abroad in a planned manner. Guru Nanak Sahib JI was arrested and released later in the year 1520, after he challenged the barbarity of Mughal Emperor Babar who invaded India at that time. Thence, the saint settled down at Kartarpur city (now in Pakistan in 1522 and stayed there for the rest of his life till1539. Having sensed his end, this divine being installed Bhai Lehna ji (Guru Angad Sahib) as his successor in 1539. 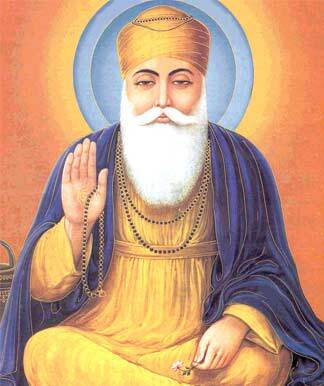 Nanak established Sewa, Kirtan, Satsang and faith in God as the fundamental concepts of Sikhism. He preached the theory of a formless or Nirankar creator to his followers who is believed to be an ever-lasting creator or Karta Purakh. Also acting as a social reformer, Nanak Sahib also worked hard for the upliftment of women, downtrodden and the poor. The citadel of Hindu caste system also suffered a great blow form Him. Having written 947 hyms of Japuji Sahib, Asa-Di-Var, Bara-Mah, Sidh-Gosht and Dakhani, Nanak is definitely regarded as a born poet. An amalgamation of a saint, poet, social reformer and a born leader, Nanak was considered not the image of God, but God Himself by Guru Arjan Sahib Ji.